This is an introduction to the Fractal of ten, a new teaching. Cost includes 428 days of access after purchase date. The Fractal of ten breaks down into three and seven. The three are about the Trinity and the last seven are about the Redemptive Gifts. When the three and the seven are in right alignment with the Fractal of ten, the life of God flows from Him to us. When Jesus was in the Garden of Gethsemane, He was in right alignment. The outside world was ugly, but because He was in right alignment, the life of God was still flowing to Him. If the Fractal of ten is broken, it can have different expressions. For example, not being able to sleep at night or having difficulty losing weight. For the communion service, Arthur does some warfare prayer around the Fractal of ten, particularly regarding demonic attacks. I found this teaching and warfare (Day 1-2 on fractal 10 and the ones that followed) very powerful in my own life and in my counselling practice. For some there were immediate shifts (in areas that were stuck for years) that stayed. Others are still in process. I've just listened to this one again after the first one in the April warfare - and WOW. I felt God breaking down a few more walls. 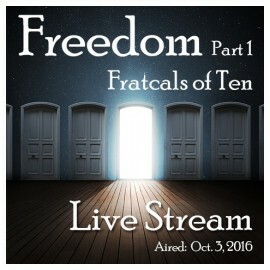 I first watched this lifestream after it was archived and still i felt the freedom even though not doing it live. I really enjoyed doing communion, being prayed for and joining in with the prays for others. Thanks Arthur. It was interesting in learning about the fracture of 10 and knew I was then to go and talk to the 7 portions of my spirit. And bring them back into alignment with the Godhead. And this in itself has brought much freedom for me when dealing with curved balls thrown at me. Do you own a cross? It is the most universal symbol of Christianity. We identify much with that structure. But what about the structures that are invisible? Which spiritual structure is most significant to you?